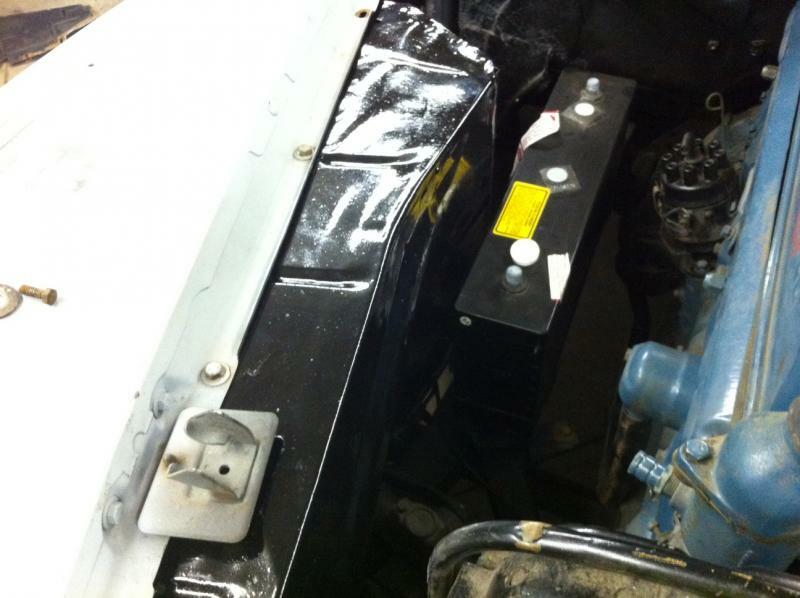 Well, since the front sheet metal is all off, I decided to remove all of the undercoating all over the inner fenders. I got all of it off and put a first coat of POR15 on the one side. Tomorrow, first coat on the other side. Then, maybe I can start installing the front end back on the car. Still awaiting my battery tray. 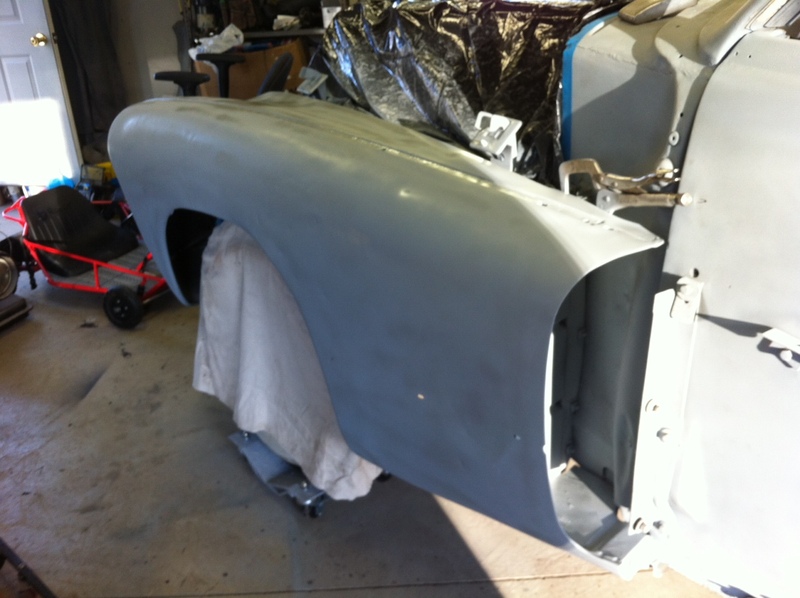 Finally getting warmer and maybe I can do some of the last little bits of bodywork on the front fenders and hood. Everything else is ready to go. I need to get out and decide on a sealing primer, the paint company that I'm going to go with and get the paint, etc. Second coat of POR15 on the inner front fenders. should have my battery tray soon. Might have to second coat the engine compartment side of the inner fenders. I want it to look as nice as possible. Right on! :cool: So you installed the inner fenders before the actual fender? I was wondering about that as I took them off the car still attached to each other. I was wondering what order they should go back together in. I'm not looking forward to lining those back up and getting them to work with my hood all based off of that radiator support. Ok, here are a few pictures. It looks a lot better and I keep reminding myself that I'm gonna drive and enjoy it, not trailer it around! Still have some more beating and banging to do on the drivers fender. I shot some primer and tomorrow I'll sand a little and find my low/high spots. 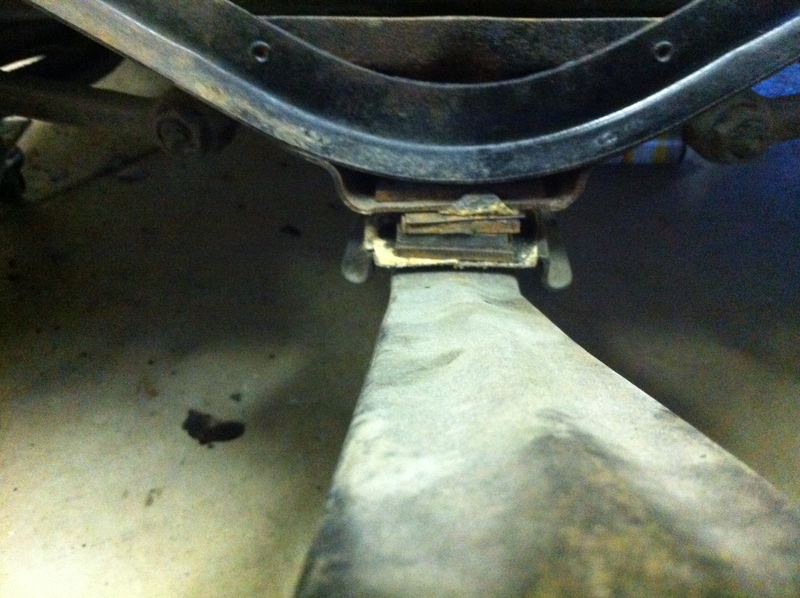 The one picture is of the spacer that is required under the radiator support mounting. This is the most important alignment shim setup on my car. It aligns the front end sheet metal with the body and the hood to the cowl section. 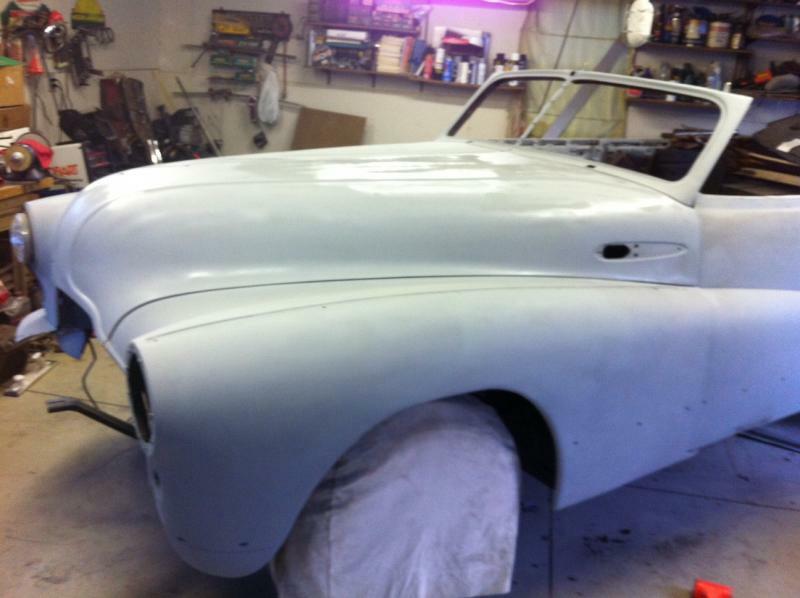 Thanks to a fellow 47 Roadmaster convertible restorer Paul Girard for helping me out with the measurements. Keep up the good work Matt! It's looking good. 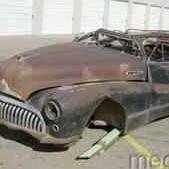 I went through a bunch of similar stuff with my '41 Roadmaster, and at times it seemed never ending. Which of course is right, as I don't have the interior done yet, hopefully this year! But it was really fun to actually drive it! 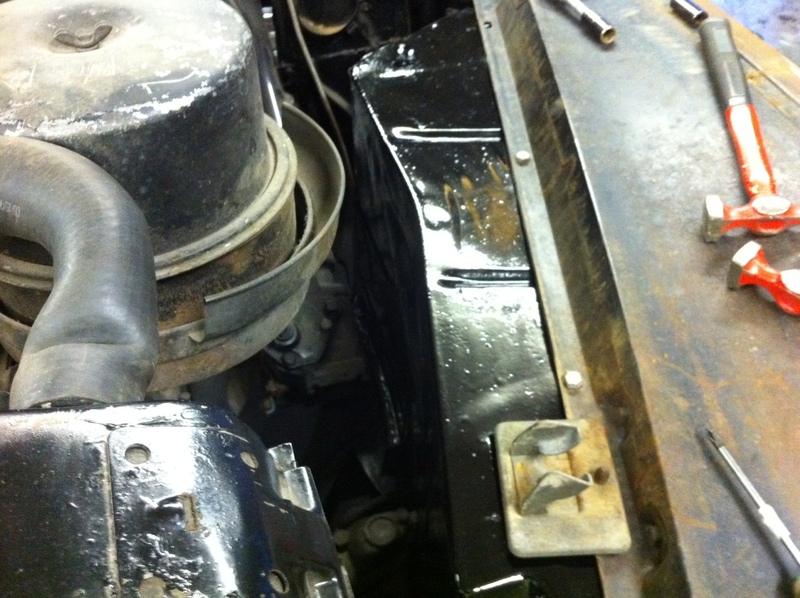 Ok, sheet metal bolted back in place and hood installed once again. 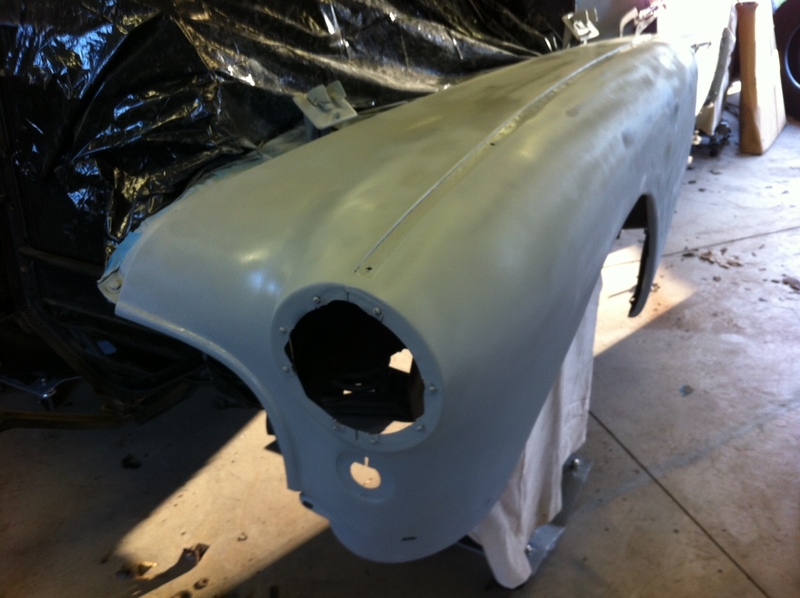 Previously missed dingers in the hood now taken out and hood back in primer. Still have a few small alignment issues with the fenders to the doors, but the hood is "MUCH" better. I think the left to right is now correct as my spacing on the cowl to the hood is correct from side to side. Little by little, the last few details are disappearing before I'm ready to shoot the Epoxy primer to seal all of this up and get ready for paint. A couple more hours tonight working on the passenger side door pontoon. After re-aligning the front end sheet metal, it was very evident that the pontoon was warped more than previously thought in the last round of straightening. We'll see how things look tomorrow. I have an extra set of doors that I can pull the pontoon off of, but hate to use the extra. I'm working on planning how I'm going to shoot the parts of the car and the car in a 24 X 24 garage. I will probably to hood, rear fenders, pontoons, rocker extensions, etc. first with the car out of the garage. Then I'll have to find somewhere to put the painted parts while I shoot the car in the garage. Will probably be a marathon weekend when this happens. Saturday and Sunday both. Any thoughts???? Wifey says the painted parts are NOT going in the living room. Doghouse? Since it's going to be your room anyway, if you try to bring any of those smelly parts into the house. "Aw, hon, it'll only be for a coupl'a seasons, until I can bolt it all back together." Awww c'mon Matt. You can charm her into it. I convinced my Mom to let me store cleaned and painted parts in their spare bedroom. Robert stole the hall carpet and used it outside. ...and those parts weren't even painted on the side touching the carpet. Warped pontoon is now "officially" un-warped! Now just need to drill out some spotwelds that popped loose in the un-warping session and re-weld. Then a skim coat of filler and that is that. A little wet sanding and glazing filler for scratches and I'll be ready for epoxy primer. I's gettin' really excited!!!!! What brand filler-primer do you use? Just using rattle can. Not at home right now, but i think it's rustoleum. Everything will be sealed with epoxy from ppg as that is what the paint is gonna be. A little sanding here and there on the pontoon. A little filler primer to fill some heavier scratches. Started the painstaking organization of the parts that need to be taken to the chrome shop. Inevitably, some of the parts will have to wait until winter time as the funds just aren't going to be there all at once. I am going to do the parts that are big and functional on the car. Some of the trim items and handles, etc. will probably have to wait. I will take it all with me to see what the price will be so I can send my wallet into sticker shock. Will have to see. Moved her back around in the garage and backed her out today. Cleaned all of the dust off the car, and fit the pontoon on the passenger door. Finally it is back in primer and looks good. Going to have to work on the front end sheet metal alignment some more, now the hood isn't centered and I don't know how I "hosed" that up. Fender seems low on the passenger side too. GRRRRRR! Still, all in all, every time I do anything to the ol' girl, she's closer to being done.